Konqi is working the infrastructure! KDE software is hosted on infrastructure managed by the KDE Sysadmins. If needed, a ticket can be opened on https://go.kde.org/systickets (or http://sysadmin.kde.org/tickets). Every accounts in the KDE infrastructure are synchronized in a same system. It is called KDE Identity. The KDE projects are mostly using Git. The repositories can be browsed online via our web interface. Find our guidelines and informations about the Github mirror. Some projects such as i18n (to localize the programs) or some websites still use SVN. The repository can be browsed on https://websvn.kde.org/. Some guidelines could be found here. Find out how to get commit access. 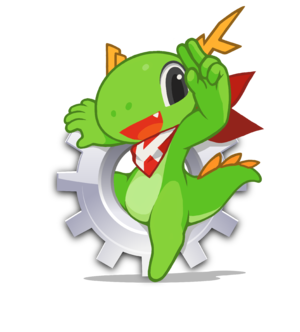 In order to distribute and spread the software and other data produced by the community, KDE uses mainly two distribution networks. Before pushing code to the repositories, the community has to review it. The current used system is Review Board. However projects are heavily encouraged to move to the new system: Phabricator. Projects are now managed with Phabricator. To ensure high-quality, KDE software operates a continuous integration system, namely Jenkins. KDE Developers are encouraged to blog about their actions. More information about blogging here. KDE provides email aliases in @kdemail.net and @kde.org. https://api.kde.org, where the kapidox documention can be found. Project metadata, used for various internal and external scripts to aid in source code compilation, continuous integration, translation, and other administrative tasks. This page was last modified on 4 December 2018, at 10:46. Content is available under Creative Commons License SA 4.0 unless otherwise noted.